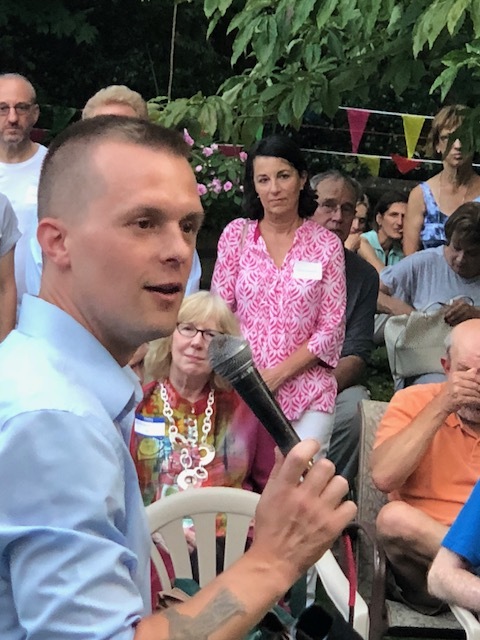 On a recent sultry summer evening, well over 100 people crushed into a suburban Newton garden to hear Jared Golden, candidate for Congress. Haven’t heard of him? That may be because he is from Maine’s second Congressional district, currently represented in Washington by Republican Bruce Poliquin. That night’s attendees understand the need not to be distracted by Bob Woodward’s book Fear or the New York Times op ed piece by an anonymous senior official of the Trump administration, both talking about Trump’s dangerous shortcomings and the efforts of insiders to protect the Republic against him. What matters now is flipping enough congressional districts from Republicans to Democrats to regain control of that branch of Congress. That will take dollars, shoe leather and grunt work. Poliquin has lots of money and the name recognition that comes with four years of incumbency, but recent polls show the candidates neck-and-neck. This district is tippable. Poliquin is tagged with a a reputation for ducking into men’s rooms to dodge questions about where he stands on the Affordable Care Act. While the bathroom story may be apocryphal, and while Poliquin makes a big deal of making his mobile number available, his constituents find him elusive. I thought he sounded reasonable if reserved at a New England Council meeting more than a year ago, but his actions belie that seeming thoughtfulness. Golden, 35, is a Marine Corps veteran who enlisted after 9/11 and, after serving tours in Iraq and Afghanistan, returned to get a degree from Bates College. Elected to the state legislature in 2014, now assistant majority leader, he led a push for health care for vets suffering from PTSD. His main focus today is on access to health care for all. One in five constituents in Maine’s 2nd district, a rural, working class district, is on Medicaid. Poliquin is running an ad supporting rural health care, but he voted for the bill to repeal Obamacare, cutting $800 billion in funding and eliminating coverage of tens of thousands of Maine residents. As Congressman Joe Kennedy, who is campaigning for Golden, observed, those numbers show the hypocrisy of the Poliquin ad. The incumbent also supports higher premiums for pre-existing conditions, and he voted for the tax cut bill that added $1.5 trillion to our national debt. Golden also talks about political reform, overturning Citizens United and being accessible to constituents for real, unlike Poliquin. He worries today about the future of democracy and is definitely of the new generation. He has said he won’t vote for Nancy Pelosi. No incumbent has been defeated in Maine’s second district for more than a century. But the Cook Political Report notes that Golden may be one of the Democrats’ top candidates nationwide and rates the race a toss-up. Nationwide, many of the most promising candidates are women, particularly women of color. And several of those women are veterans, like Texas’ MJ Hegar, pilot of a rescue helicopter, New Jersey’s Mikie Sherrill, a fighter pilot, and Kentucky’s Amy McGrath, a former Marine pilot. Massachusetts Congressman Seth Moulton, also a veteran, is mentoring this next generation. If the Democrats are to win back the House, it has to be done district by district, and that means county by county and street by street. That will require turning off CNN and MSNBC, even occasionally NPR, and writing checks, signing postcards and otherwise rolling up our sleeves. Consider the price of failure. This entry was posted in Politics, Uncategorized and tagged Amy McGrath, Bruce Poliquin, Congressman Joe Kennedy, Congressman Seth Moulton, Cook Political Report, Democrats controlling the House, ending the Affordable Care Act, flipping districts in November, health care for all, Jared Golden, Maine's second congressional district, Mikie Sherrill, MJ Hegar, repealing Obamacare. Bookmark the permalink. When: Sunday, September 23, 2018, 3-5 PM. What:	Food and Drink for an Early Fall Sunday Afternoon, Live Music, Friendly Environment.